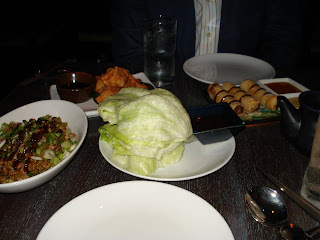 Tao, another location that was heavily recommended on Chowhound, was a more than I expected. At first I thought it would be a little on the cheesy side, seeing as it is in the Venetian, and I don't care how well it's done, the idea of Venice in Nevada is like a can of cheese wiz. 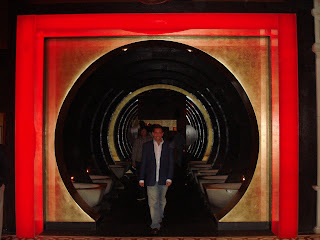 Tao is also a lounge, so I figured full bore hair gel, square toed shoes, untucked striped shirts, and a lot of techno. Despite those preconceptions, I was a big fan of Tao, although Tao did not dissapoint. There was even a zen sand garden glued to the wall. Overall it was a rather intense experience, with lots of red and black, Buddhas everywhere, dim lighting, and a constant techno beat. After a half hour wait in the lounge, Michael and I finally got a table and got down to business. This is a dish that I remember from trips to San Francisco when I was a little kid. 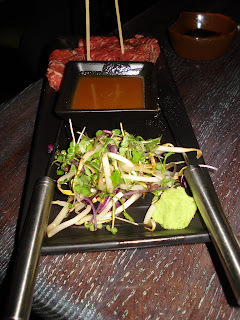 It’s not something you see on the menu very often, but Tao did a great job with these. 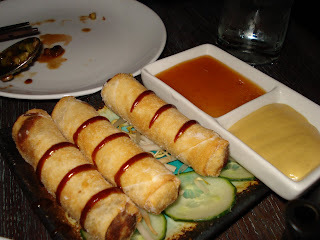 You can’t go wrong with a good spring roll, especially when it is filled with duck. 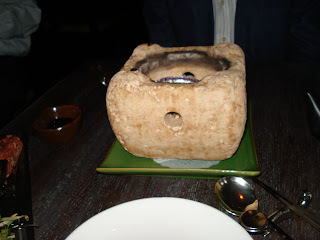 The rock with a sterno candle in it was just the beginning for what would become a stellar entre. I know that it’s bad picture, but taking multiple shots in a dimly lit restaurant is a little conspicuous. That, my friends, is 6 ounces of kobe beef ready for shabu shabu. 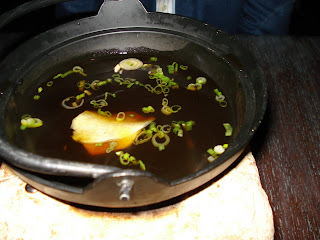 Given the opportunity, I would have drank the entire bowl of broth, it was that good; mixed with the flavor of kobe beef, it was even better. I had to snap a photo of this on the way out. 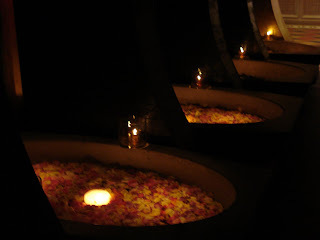 These are stone tubs full of fresh flower petals. I’d read online that on prime nights these are full of half naked girls frolicking in the water and petals. I guess Sunday night isn’t prime time, so no girls, just petals. T is a far, far, far far faaaaaaaaaaaaaaarrr cry from a half naked girl.